I love that we’re all different and we all have cultural oddities that, while considered totally normal in one country, may cause visitors to raise their eyebrows. China was full of these little surprises! Some were amusing, some were heart-warming, and some were a little unsanitary to my out-of-town eyes, but all contributed to my enjoyment of my trip and make me look back on it with great fondness. I will certainly be returning to China with Alex and Theo; it’s a fascinating and beautiful country and I was lucky to meet some wonderful people who were able to teach me about their history and culture. So, in celebration of our idiosyncrasies, here is a list of 11 cultural quirks I witnessed in China. Spitting isn’t considered rude. Much like sneezing and coughing, it’s just another normal bodily function in which fluids are expelled, and one’s throat and nose are cleared. The sound of people hacking up phlegm much like a cat brings up a furball takes some getting used to, especially when in the close confines of public transport and restaurants, or when the noise is coming from the stranger walking right on your heels down a busy street. Taxi drivers are particularly renowned for this delight, but who can blame them when the spend all day breathing in heavy car fumes?! Similarly, spitting food out isn’t something that’s done discreetly with darting eyes to check no one’s watching and behind a hand or napkin to preserve your dignity in case you are spotted! My most memorable experience of this was during an incredible meal shared with new Chinese friends. Ghost Street (Guijie) in Beijing stretches for over a mile and is home to over 200 casual, family-run restaurants serving up mouth-watering dishes at tiny prices at any time of day or night (transport tip: alight at Dongzhimen subway station). Red lanterns hanging above the street flicker on shortly before sundown and contribute to the festival atmosphere. The celebration is food; traditional recipes from each of China’s regions along with international fare. We entered a Sichuan restaurant and after a brief exchange in Mandarin between the waiter and Hoover, a born and bred 30-something year-old teacher from Beijing, we were shown to our table and promptly served complimentary appetisers while we waited for the bull frogs, lobster, prawns and hot pot that Hoover had ordered. Provided you don’t have special dietary requirements, always allow a local to choose your meal! The zing of ginger, the aroma of garlic, and the fire of chilli filled my mouth – the food was amazing (although, personally, I found both duck and frog intestine to be a little chewy for my taste)! I learnt something new during this meal: humans can remove the shell, legs and head of a prawn using nothing but their tongue (not this human, but others evidentially can!). As my dining companions dissected their food inside their mouths and then proceeded to indiscreetly discard the inedible and unwanted bits by spitting them on the table and floor, I looked around and saw everyone else doing the same thing. I am all for cultural immersion and doing as the locals do, but the stereotypical overmannered Brit in me could only manage removing my frog bones and prawn shell behind a covering hand, placing them neatly on the table and ashamedly concealing them under the lip of my plate. It is common for babies not to wear nappies before they are toilet trained. Onesies have gaping holes at the crotch and if they need to go while out and about, parents simply hold their infants either over a tree or over a public rubbish bin. I still haven’t worked out how parents predict this and prevent themselves from being accidentally covered; speaking from experience, babies don’t give much warning for their toileting needs and once they start, there’s no stopping them while you get them to the nearest tree! Are parents in China carrying around multiple changes of clothes for themselves instead of for their baby, as I did?! I support anyone not wanting to use disposable nappies, but I think I’ll stick to our lovely cloth nappies rather than dangling defecating children in public places! On one occasion, a baby wearing one of these gaping onesies was thrust at me, which brings me to my next point. Be prepared for a lot of attention and endless photograph requests! The mother of this child wanted me to hold her baby so she could take a photograph of me holding him. I posed for photographs taken by strangers like this every day of the 7 week trip, and although I always obliged with a smile, it got very exhausting and I longed to once again blend into the crowd. Weirdly though, I sometimes felt invisible. I wasn’t; a white, blonde female by herself with a backpack – I stuck out like a sore thumb! Brits are known for loving an orderly queue so I had to bite my tongue through the seemingly mandatory pushing and shoving that is more common in China. Queue jumpers lurk next to every ticket booth, information desk, and till, and the use of elbows is recommended for surviving the metro crush. In London, if someone tries to get on a tube without first stepping to the side to let people off, they receive a tirade of dirty looks, huffs and maybe the odd sarcastic comment. I did the same in Beijing but was promptly bulldozed directly into the people trying to alight by a wall of angry, shouting commuters behind me (as an aside, in Beijing, every hour is rush hour – don’t say I didn’t warn you!). Speaking of shouting, unless you speak Mandarin, everyone sounds like they’re shouting and angry. Of course, they’re not; Mandarin is a tonal language and requires a wider vocal range than English, and I think the Chinese are also possibly more expressive in their speech than Brits. Although my culture tells me that the tendency to push and shove in China is rude, I found people to be exactly the opposite. Complete strangers really wanted to go out of their way to be helpful. After stopping people to ask for directions, I was shown around Chongqing by an 18 year old who wanted to practice her English and was then taken to lunch by her and her mother, and a guy in Hangzhou took me on a tour of several temples, translating every information point we came to and also giving me additional history and politics lessons, that were fascinating and included details I would never have otherwise known. I have numerous stories like this of kind people jumping at the chance to help me out, but my favourite occurred on a night train. My zig-zag travel across China was all done by train and I booked my onward journey when I had got to each place and figured out how long I wanted to be there. This meant that several of the sleeper trains I booked didn’t have beds available, nor seats, so I slept in the aisle on my backpack for journeys as long as 19 hours. Anyone who has travelled on China’s trains in the budget carriages will know that they are no Virgin Trains (or even Southern Rail – a timely joke referring to Britain’s currently most hated rail network), which feel like luxury in comparison. They’re filthy, smelly, incredibly cramped, and the toilets are enough to give you nightmares, but they got me from A to B relatively reliably and I met some interesting characters that made the long distances feel shorter. On this particular over-crowded journey, there was a rush to buy tickets for the beds that had just become available as passengers disembarked at each stop, and huge crowds formed around the conductor selling them. I jumped up and focused my attention on at least grabbing a newly empty seat. At the next stop, the conductor approached me through the swarm of people trying to wrestle for the much coveted tickets and passed me a note. I opened it. Scrawled in handwriting that suggested the author rarely formed these foreign shapes, I read the words ‘Follow me’. My brain did a quick ‘this could go one of two ways’ calculation. Screw it, I’m following him! He led me through the heaving carriages, stepping over other unlucky passengers in the aisles, and into a sleeper carriage. Now, I’m not in the habit of following strange men into bedrooms but as he showed me to an empty bunk, I was very grateful for his kindness in reaching out to me (and also now pleased that I didn’t blend into the crowd – it’s swings and roundabouts!). There’s no such thing as personal space. I found people in China to be very touchy-feely. It’s really very endearing, but a bit of a surprise when your culture is just the opposite! Londoners complain about having to get up close and personal with other commuters on the tube; a trip to Beijing or Shanghai would certainly put it in perspective! It’s not just the forced closeness though. I was constantly touched by strangers, all intended in a friendly way but nonetheless, a little unsettling at first. Unexpected hugs, taking my hand, patting me on the arm, even a few cheek pinches, which I don’t think anyone has done to me since I was a toddler! I was in China during the height of summer. It was sweltering! When I stopped in restaurants and cafes, I really wanted cold water, but was always brought freshly boiled water (obviously knowing your water has been boiled is very reassuring but filtering it or treating it are also alternatives to buying bottled water). I don’t drink tea or coffee, and don’t understand how hot drinks can possibly be considered refreshing when it’s a million degrees and humid, but I was always looked at like I’d just walked off Mars whenever I explained that I was after cold water. I’m no stranger to squat toilets and was expecting to only find seated toilets in accommodation, but thought I’d mention it here for anyone who isn’t yet clued up about this. All public toilets in China are squat toilets, you won’t find toilet paper in any of them, nor will there be any soap. My advice is to always carry loo roll and hand sanitiser, use the toilet before heading out for the day and again whenever you stop in restaurants. Having soap with you is a nice option but there’s no guarantee that toilets will even have running water with which to wash your hands (or flush the loo!). A word of warning: public toilets can be disgusting everywhere in the world, but China’s are the worst I have ever seen. Let’s just say, they’re not well maintained and some people clearly haven’t mastered the squat and catastrophically miss the hole when they do their business. Eek! Don’t miss out on visiting the public parks; they’re lovely hubs of everyday life and I learnt so much about Chinese culture by sitting and people-watching. Unlike in the U.K., where the most interesting things you’ll see on your average day in your average park are dog walkers, runners, cyclists and kids with scooters, parks in China are central to the community and used by everyone for a whole range of wonderful activities. With speakers blaring, large groups of people gather to partake in group dancing (mostly ballroom and line dancing), tai chi (with and without swords! ), kung fu, and a sport that blends tai chi and tennis. People of all ages line the paths, engrossed in games of Chinese Chess and Mahjong, and intricate calligraphy is painted on the walkways. Paper and bamboo kites float on the breeze, and large spinning tops are flung into rotation by the crack of a whip. These are pastimes for adults as much as children and can even be taken to competition. Feel free to join in as well! What quirky cultural differences have you noticed when travelling? Perhaps you spotted something in China that I haven’t included here. Share it in the comments! Fascinating observations. I haven’t been to China yet, but have definitely noticed the “personal space” issue with Chinese tourists in Europe so it’s interesting to hear more. And a groundskeeper I met in New Zealand recently definitely made a few comments about the number of Chinesetourists who missed the hole when squatting on TOP of the flush toilets at the park. What gives? Haha, oh dear! I guess something so habitual as how we use the loo is difficult to change or work out how to do it differently! Glad you enjoyed the post! I’m always impressed by women traveling alone and have been since the 70’s when there was no internet, credit cards…anything! But it is still a very dangerous planet for women, unfortunately, so brava! That said, China always felt physically safe, and the scams that supposed to be around every corner never materialized for us. Just the wonderfully friendly, helpful strangers you mention. Annie and I just returned from nearly a month in China. It was great! My big tip would be to travel later in the year. We were originally planning to go in early October, until we learned about the Chinese National Holiday. Crowds! The biggest crowds all year and in China that means crushing proportions everywhere. So we went the last week of October through mid November. 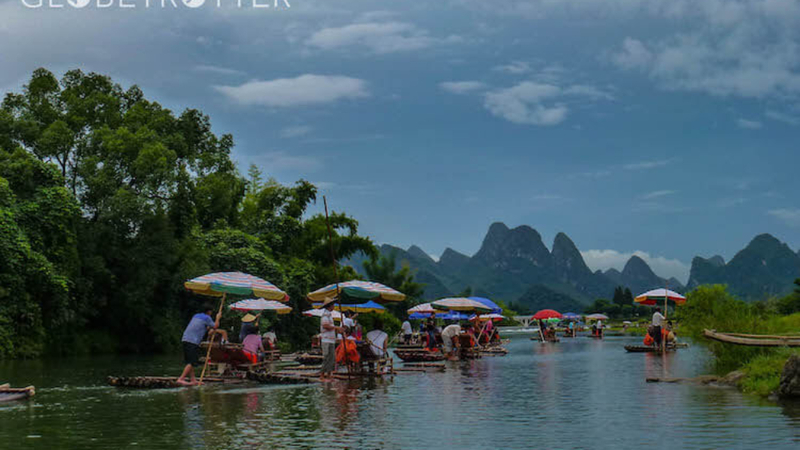 We biked through the beautiful Yulong River valley to the small bamboo rafts (unlike the commercialized giant blue plastic rafts on the Li River with their noisy motors). It was November but the weather was holding and we had the river to ourselves. We were the ONLY raft on the river. You’re always going to be around people in China! So I advise going when everyone plans to stay home. Gotta go back. Am I right?! Thanks, Clint. Great tip to go later in the year to avoid crowds! It sounds like you had a wonderful trip. My favourite sections of the Great Wall were also the unrestored ones, but unlike your experience, when I was there, they were just as busy as the more popular restored spots. Definitely got to go back! !